I have been waffling on in recent articles about kick-scooters about how much I miss pneumatic tires. 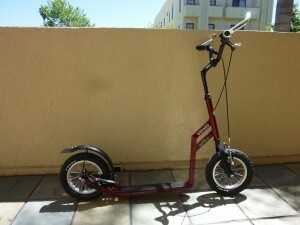 Yes, the small solid tired folding scooters are convenient and portable, and in the cases of the Know-Ped and the KickPed are also reasonably comfortable at slower speeds on slightly rougher surfaces, but it takes air tires to properly isolate the rider from the tiring vibrations of the road. I was not perfectly happy racing around hunched over my large wheeled Kickbike during the mid to late Naughties, but have fond memories of standing up straighter and cruising around on an old 12.5 inch scooter back in the late Eighties. 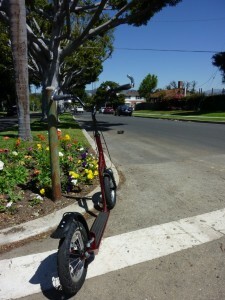 It is not completely impossible to buy such a scooter in the USA but a really efficient ride with a low to the ground deck, which is of vital importance, currently requires an importation. I Imported my Mibo Gepard from a Czech store that accepted PayPal. This was easier than messing around with a bank wire transfer. The store was Hopsej.cz. A rider in Canada had bought the same scooter from the same store and he pointed the way for me. Thanks Samokat! From purchase to receiving was nineteen days and my total cost was $426 USD. Assembly was easy, taking just five minutes or so using a 15 mm wrench to put the front wheel on, a 6 mm Allen wrench for the handlebar stem adjustment and a 5 mm Allen wrench for the V-brake cable adjustment and the rotation of the brake handles and bar ends. My first five mile test drive was a delight. I did not intend it to be a sprint but in my excitement I averaged 10 MPH without it feeling like an exhausting ride. To a cyclist, that may sound slow but it is quite fast for a scooter. It was comfortable and fun and engaged my whole body without undue impact. Not since my BMX style scooter in the Eighties and my briefly owned Sidewalker City in the Naughties, have I had a kick-scooter that so easily retained stability when riding one handed. This is due to the combination of a wide air tire and wide handlebars. I have no reason to ride one handed but it is nice to know I can wave at someone or signal a turn without falling over. The Mibo Gepard is reasonably lightweight and easy to pick up and carry. It officially weighs eighteen pounds, although mine seems to tip the scale at nineteen pounds, which is about as much as one and a half Know-Peds, but somehow it feels much lighter than that, and it does not drag you back on a moderate incline. The handlebars adjust up to a yard high if you rotate the bars back to straight up rather than raking them forward of the wheel, and this allows a five foot eight inch rider like myself to cruise upright without having to crouch in a racing position. Taller owners can always buy higher handlebars and longer brake cables from a local bike shop so that they can stand straight also. I cannot criticize the comfort of the ride in any way, however the Mibo deck’s narrow width means you do initially have to careful switching feet until you get used to it. My running shoe is wider than the deck. It is probably better to wear a more minimal shoe than an inhumanly large, bloated modern running shoe, as long as there is some forefoot protection and grip for the pushing foot. People upgrading from Razors will not find this deck narrow, and scooter riders who stand diagonally across their decks like they do on skateboards will still be comfortable and stable as long as they focus their weight on the forefoot. The front and rear Shimano V-brakes, designed to stop an adult on a fast-moving heavy bicycle are strong enough for any scooter situation on any gradient. The only accessory is the bell, quite handy for politely signaling wandering pedestrians (without earbuds) of your imminent arrival from behind. No kick-stand, but typical spring loaded kick stands are usually more of a nuisance during riding than a convenience when stopped, and contribute to weight and rattling. Rather than get too far into statistics and comparisons, I will simply say that this scooter is light, stable, fast, efficient, safe and portable and is therefore better for most situations than a large-wheeled foot bike, or a hard-wheeled folder. I am personally a passionate fanatic of two 12.5 inch wheels, perhaps mainly due to nostalgia, but the best selling Mibo, the Mibo Mastr, is probably the better choice for most Americans as it folds, (an important feature for sedan owners or bus riders), has an extra four inches of bar height, and has a sixteen inch front wheel. The feature that contributes the most to the Mibo’s ride is the low deck. As a deck gets higher, the ride gets more tiring. I cannot overstate how important a low deck is to the efficiency of a scooter, and am constantly surprised by the number of overly high decks that come out on scooters from Belize, Sidewalker, Swifty and others. The designers of such high-decked scooters obviously never ride scooters very far themselves or they would immediately realize their mistake on their first long ride. The Czech Republic is clearly the scooter capital of the world. Finland, The Netherlands, Germany and other countries contribute some, but there are many excellent brands in the Czech Republic, besides Mibo. One Czech brand, Yedoo, is launching in the USA this year, meaning that no personal import will be needed, but Yedoo does not bring their decks down as low as Mibo and the others. In fact the Yedoo Ox and the Yedoo Three are very much like my fondly remembered 12.5 inch Eighties scooter, but it is worth the trouble to try to obtain a Mibo, Kostka, Kolobrndy, K-Bike or similar Czech scooter if you can. Dipping down to scoot from upstairs will wear you out after a mile or so. My older article on the-vu, Kick Scooter Classifications, will explain the available choices if you are reading this review first. For me, I am happiest in the small pneumatic tire class. It seems to have all the advantages of compact folders and larger foot bikes. I am very pleased with my new Mibo Gepard. Hardly anything at all. Except that when it is time to change tires, I will go for a less knobby model than the Kenda tires that come as standard. They are smooth enough going straight but get knobby when you lean and turn. Perhaps the Schwalbe City Jet or a V-Groove or even a slick. And bent-valve inner tubes would make it easier to attach a tire pump also. Jeffrey the Barak has been riding scooters since the cretaceous era, but sometimes he likes to have a bunch of grapes while admiring trombones. You are absolutely right. I have same ideas. The Amish 12″ is really designed for children, so you, like most Americans, have very few choices without personally importing a scooter from the Czech Republic etc. This is why I imported my Mibo. The website Letskickscoot.com has a list published of almost every available scooter also. YedooUSA may possibly be able to get you a Yedoo-Three or a Yedoo-Ox without importing, but they don’t have decks quite as low as the Mibo. Of course if you want a Kickbike or Footbike or an Amish or a Current Coaster, then you need not import, but the 12.5″ class is really great and low decks are really important. Please contact me before you buy anything so I can help you avoid any mistakes! Hi Jeff, I just came across an Amish built kick scooter/bike made by Groffdale from Pennsylvania. The came in various tire sizes, beginning with 12″, then 16″, 20″, and 24″. Based on some of your reviews and comments, I’m seriously thinking of the 12″; it’s sort of like the MIBO. But I’d like your thoughts. Many thanks for all your insights. I know of someone with a 20″ and someone with a 16″ They love them. But the 12″ might need to be special-ordered if you want proper brakes. I think it just has a tire-friction back brake. It is the kid’s model. Much heavier than a Mibo I think. What this mean about grapes and trombones? How Cretaceous era? I do not understand footnote. Jeff, Many thanks for your advice. The kick scooter/bike world is rather confusing to a newbie. I’m now seriously considering the Kickbike Freeride. Front wheel is 20″, rear wheel is 12″. The Finns list it as a family bike, good for kids and adults. The US distributor says it’s a kid’s bike. It’s also called a BMX style. I’m 5’10” tall, 200 lbs., and 72 years old. My interest is in general recreation, riding around the neighborhood and in nearby parks. I’m not using it for commuting or racing. Can you give me any insights into the Freeride? Many thanks. Not really. I have not experienced that model. Apo, is Hopsej still selling scooters? They have disappeared from the site. I cannot find the ‘Gepard’ model on the Mibo english website. Does it go by a different name or is it no longer made? If its not available what might be its nearest equivelent. Thanks. Gepard is translated to Cheetah in English. It may be a legacy model though. If so there should be an equivalent model for 2013. Hey Jeff, thanks for the awesome review. From your description, this looks like exactly the scooter I want. Perhaps I want the same exact scooter as you. I tried looking up the gepard on their website that you linked but couldn’t find it. I’m 5’6″ and looking for one with 12″ wheels that fit my body. I have no idea how to go about finding this scooter and I was wondering if you could give me insight into the process and your experience. One more thing – since you had some time to get to know the gepard, do you still have a high opinion of it? Rishio, Gepard is Czech for Cheetah, and it is now a legacy model. Mibo has changed the angular “broken neck” design of the frame to a curved design for the newer models. If I had to replace it, I would try to get the same one, or perhaps look for a “top” model with upgraded bearings and smoother tires. I still prefer two 12.5″ wheels to the more popular design of the best selling Mastr (Master). But if you cannot find the exact same Gepard, look at their newer 12.5″ scooters and you will get approximately the same experience. Let me know if you buy one! Thanks. I also like the 12.5 model. Basically want as light and small as possible with inflated tires. I did more research and I think I like the Mibo Courage top (http://www.mibo.cz/eshop-product/kolobezka-mibo-courage-top) but not clear about the difference between the top and the classic. I sent them out an email so let’s see if they respond. I’m greatful for your post – I was this close to getting a kickped but this style of scooter is what I really want. 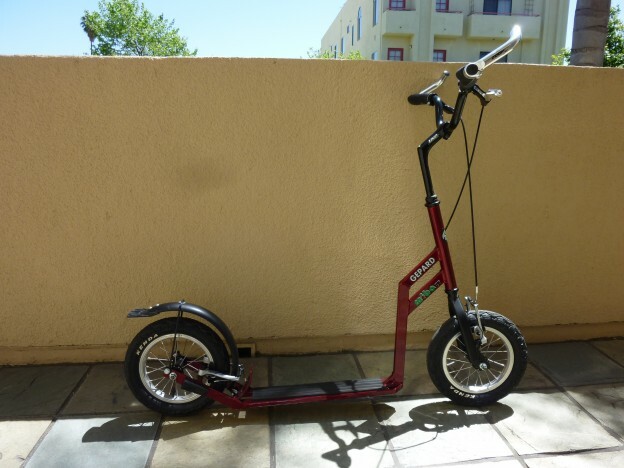 BTW, this will be my first kick scooter (aside from the one I had when I was a little kid in the early 80s which I think was a 12.5 model as well!). The Mibo Tiny is also another option but I’m not sure I want the folding complexity and extra pound. Thinking that I might be able to get the courage non-folded into a car. One question I forgot to ask in my previous posts (apologies for so many posts). The floor height on the courage top says 5cm which comes out to 2 inches. Having little experience with scooters, that does seem really low. Do you think it’s too low? I feel like it will bottom out every time I go up or down a sidewalk ramp or driveway. I like low. You may scrape bottom sometimes, but the advantage to 2″ height is you can go further and faster for the same energy input. I think you have found the right model. I got myself a yedoo ox new and the decks in new models are as low as in mibo. For a 1/3 of mibo prices yedoos are much better choice with no relevant quality cuts. I do like the design of mibos more but don’t see it being worth the premium they charge. Thanks for the comment Dezz. We were hoping to see the New Ox and the New Three in the US but so far only the kids running bikes have appeared. There is one store offering the Original Ox (with a higher footboard) for $200 but we can keep looking. Hi Jeff! Thanks for all the insightful kick scooter articles and advice! I am looking to purchase one for my commute to work. The morning part of my commute consists of 2-3 miles of uphill (asphalt or sidewalk). Is there a type of scooter you recommend for uphill travels? Is this durable? How many years you did use this scooter considering that this article was posted last 2013. It was perfect when I sold it. I never did a long term endurance test.